This September Yara Arts Group presented Capt. 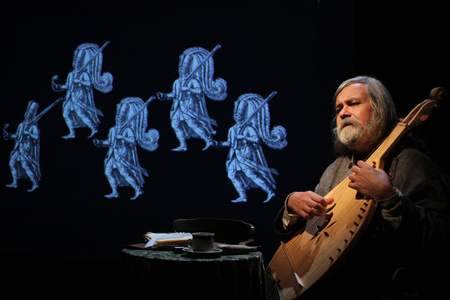 John Smith Goes to Ukraine, an original theatre piece featuring Bob Holman, poet and founder of the Bowery Poetry Club, Susan Hwang, New York performance artist and musician, and Julian Kytasty the legendary bandurist, in Lviv and Kyiv. I first had the idea to do this show several years ago when I heard Julian Kytasty play a duma and Bob Holman, a great performer, "translate" it. Basically, Bob improvised in English on what he thought the piece Julian was performing might be about – and Bob does not understand any Ukrainian. Here was a ridiculously radical approach to translation that produced some fabulous poems. I just had to get involved. Most Americans know that Capt. John Smith founded Jamestown in 1607 and have heard about his relationship with Pocahontas. But this production focuses on his "other" history -- his adventures fighting in the Turkish wars in Eastern Europe before he came to America and his unexpected journey through Ukraine in 1603. In 1630 Smith published "The True Travels, Adventures and Observations of Captaine John Smith in Europe, Asia, Affrica and America, from Anno Domini 1593 to 1629." He called it his "self-writing book" and it is one of the first autobiographies in English. Most people read only the last part about his experiences in Virginia, but Smith's forgotten eastern stories fascinated me. What really struck me was that Smith was telling similar stories of battles, enslavement and escapes across the Black Sea that I had heard Julian sing in the dumas. At the same time, Smith's stories were so outrageous that they seemed comedic. I could certainly see why many people considered Smith a braggart who could not be believed. Smith's book at times feels like a jumble of bizarre events in outrageously named places. But when I kept reading books on this subject, I noticed that opinions shifted more recently as scholars discovered that the historical events Smith described actually happened. The place names Smith mentions in the East were bizarrely spelled, but even I could recognize some. This June in the Rare Books Division of the New York Public Library I finally saw the original edition of Smith book. On one page there in the list of towns he traveled through as he headed west after his escape from slavery near the Azov Sea. He mentions: "Drohobus, Ostroge, Lasco, Halico and Collonia." By then I knew that Collonia is how Kolomyia is listed on old maps. After this list Smith comments that though these places were destroyed by the wars and were "countries rather to be pitied, than envied," "in all his life he seldome met with more respect, mirth, content and entertainment…." Smith is an icon of American history. The colonies he established not only included Englishmen, and Native people, but also Eastern Europeans and many others whose story is rarely told. Smith's own tale is tempered by his constant exposure to "others," making his reactions sometimes more nuanced than we expect. 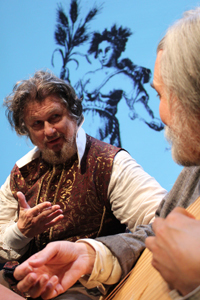 By entwining Smith's "self-writing book" with traditional material from Ukrainian dumas and poetry by a Crimean Tartar Khan, I stretched the boundaries of our material to tell a new story as our artists explored the creation of new world on stage.. I am interested in multi-lingual communication that goes beyond language. I start with poetry, which crystallizes a cultural moment, but then I expand it to create translations of the poetic images into light, movement, sound, music, projections and space. I had brought photographer Volodymyr Klyuzko to the Rare Books Division with me and the library allowed us to photograph Smith's book. We were especially interested in the nine engravings that were pasted into the book. The work of John Payne, one of the first master engravers in England, depicted scenes that most interested us: the three single-handed combats Smith wins, the ceremony in which a Transylvanian Prince names him a captain, Smith's enslavement and escape. We decided to use the engravings as projections in our shows – but to enliven them by turning them into animations. This look was perfect for the wildly funny songs Susan Hwang had written for the show. I had asked her to play all the women Smith mentions (Pocahontas was not the only woman who rescued him). 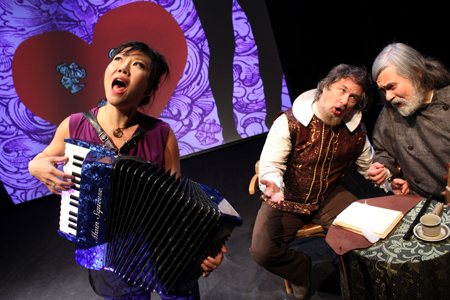 Susan wanted to develop a character that would bring modern sensibilities into a historical context, allowing for a 21st century reaction to 17th century events and brought an accordion to our first rehearsal. The show immediately acquired a post-modern Monty-Python-esque tone that delighted the audiences at Dzyga for the 20th Lviv Book Forum, Gogolfest and our week-long run at the Les Kurbas Theatre Center in Kyiv. Presented in Ukrainian and English, Capt. John Smith Goes to Ukraine echoed Smith's travels across many boundaries and is a visually and sonically striking piece that made both insiders and outsiders reconsider their own versions of themselves – and together we laughed. The show struck a cord and attracted a lot of media attention. I was interviewed for an hour on TVI and our production was featured in major articles in Ukrainsky Tyzhden (the newsweekly in Ukraine affiliated with the Economist), Ukraina Moloda, Ukrainska Cultural, Kultural i Zhyttia, Korrespondent. Translated excerpts. Bob Holman & Susan Hwand in "Bowery Poetry Club Live in Lviv"
Yara also created a series of special events in Ukraine, such as "New York's Poetry Club Live in Lviv & Kyiv." Bob Holman, who founded the Bowery Poetry Club, kicked off the evening by reading his own poems which were also read in Ukrainian translations by Kateryna Babkina. Serhiy Zhadan was the first Ukrainian poet to read at the Bowery when he came to New York in 2005 to work with Yara on a show at La MaMa. He read several poems from that appearance, while I read the English translations I had done with Wanda Phipps. 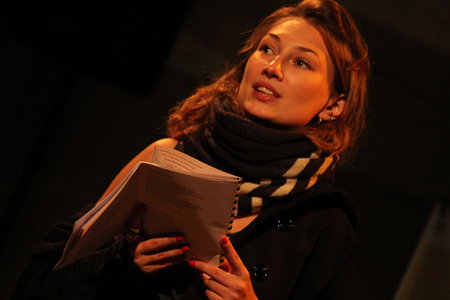 Ms. Babkina was the most recent Ukrainian poet to appear at the Bowery Poetry Club. She read there in April when she came to work on our Video Poetry Event at Kinofest. She is a wickedly funny reader of her own poetry; Susan Hwang and I read English translations of Kateryna's poems I had done with Ms. Phipps. 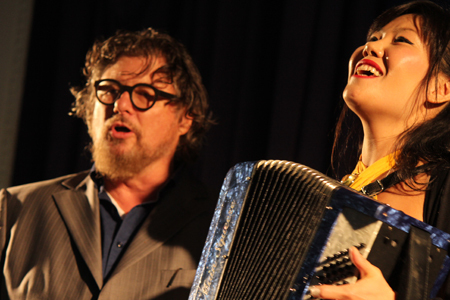 Ms. Hwang also sang several original songs such as "Parking" with Julian Kytasty. Then Julian and I read our own poems and we concluded the event with all of us singing Ms. Hwang's song "Crossroads of the World" from the Smith play. The event took place at the Kurbas Theatre in Lviv as part of the 20th Lviv Publishing Forum and was repeated at the Kyiv-Mohyla Academy under the sponsorship of the US Embassy. We put together a chap book with many of the translations. We also did a presentation on Epic Songs, Dumas, Hip Hop and the Oral Tradition at the Honchar Museum in Kyiv.